Millington point guard LaKeron Garcia fires a pass on a fast break against Briarcrest. Millington Trojan senior power forward Nick Hunt looks for a post pass from teammate Jordan Browning Saturday night against Briarcrest. The Saints were able to hold on for a 65-55 victory. EADS — Last year all the talk prior to the Millington/Briarcrest game was about Austin Nichols. The former Briarcrest Saint was busy this past Saturday helping the Memphis Tigers win 79-69 over the Temple Owls in Philadelphia. His alma mater was back in Tennessee hosting the Millington Trojans in the Briarcrest Gymnasium. And it appears Nichols has another athletic post player following in his footsteps. Briarcrest sophomore Micah Thomas threw down two powerful dunks, showed an outside shooting touch and helped pace the Saints to a 65-55 win over the Trojans. Thomas got the scoring started with a three-pointer in the first quarter. That was part of Briarcrest jumping out to a 14-4 lead. Millington cut into the double-digit deficit with a Jordan Browning layup and Devynn Brandon drive to the rim for two points. The Trojans were behind 14-8 heading into the second quarter. Browning cut that into half with his first shot in the second quarter with a baseline three-pointer. Briarcrest rebuilt the lead to 19-11. Millington’s Julian Daughtry answered the Saints with a floater in the lane. The Trojans climbed within two points when Brandon attacked the rack again to hit a layup through two Briarcrest defenders. The Saints proceeded with a 11-7 run to transform the 19-17 score to a 30-24 halftime lead. 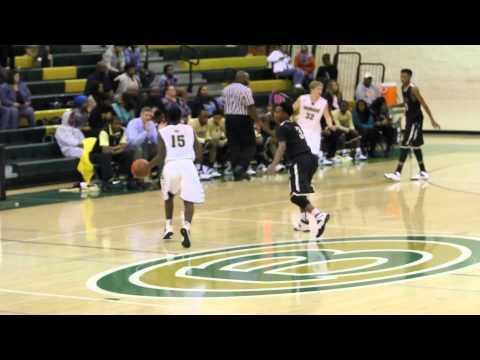 Briarcrest point guard Mark French scored 7 of those points including a trey. Briarcrest build its lead to 47-36 by the end of the third quarter. When Thomas scored on a three-point play the Saints were ahead 47-34. As the third quarter wrapped up, Trojan Roddarius Pitts started to take over the game. The senior guard darted a pass to teammate Devontae Winston for a layup seconds before the third-quarter buzzer. In the fourth quarter Pitts used his shooting touch to keep the Trojans within striking distance. Pitts scored the first 8 points of the quarter with a pair of treys to make the score 47-44. The Saints snatched by momentum with buckets from Gus Gran and KeShun Pinkney. The Briarcrest lead grew to 56-44 when Will Hrubes scored on a layup in the lane. Despite Millington outscoring the Saints 11-9 in the final second of the game, Briarcrest’s lead was big enough for victory. And the final bucket of the night was a Thomas one-hand slam. Millington coach just won’t use his bench. Millington struggle on getting rebounds all year long. The thing that makes me mad about it, is that he has a player about 6,5 that has the number 33 and that can jump out the gym. I seem this kid play in the JV game pulling down all the balls.